I need some help with a little problem. After a recent camping trip I discovered that squirrels had been in the engine compartment of my vehicle and had eaten through some of the wiring. The dealership that repairs my vehicle is giving me a $200.00 estimate to repair the damage the squirrels caused. It seems there is no absolute solution to this problem. I called the campground where this occurred to advise them and to let campers know what happened to me. Please help! Do you have a solution that works? Oscar, remember, determining the cause of the problem of critter infestation is just as important as preventing the problem, if not more so. There are three crucial requirements to attract and sustain unwanted guests; food, water and a secure route between the food source and their nesting places. Begin by eliminating any source of food or standing water near your RV. 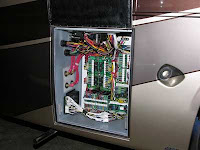 Be sure to clean up any food or liquid spills inside and outside the RV completely. Avoid placing open containers of pet food in or around the RV. Refrain from feeding the birds around your campsite. Good housekeeping practices can eliminate one and possibly two of their requirements. This is your best defense since, unfortunately, it’s nigh impossible to fully secure the engine compartment of any motorhome. As for ridding the rig of existing guests, live traps can be purchased or rented. Check with a local pet store for availability. I am not in favor of commercial poisons for the obvious reasons associated with children, pets and recreation vehicles. Additionally, I do not favor the home brews such as carbonated soda, etc. Though I personally have not tested one, I have heard of great results using electronic pest eliminators which emit pulsating, ultrasonic sound waves that affect the nervous system of the animal making it uncomfortable for them to be around. These electronic devices are harmless to humans and domestic pets. Some are powered by 9-volt dry cell batteries, while some are 120-volt AC powered. This might be your best defense when visiting that particular campground. Labels: Critters, DC Electrical, Misc.